We’re big fans of Hootsuite at AllTwitter – I’ve been covering the popular social media dashboard since 2009 – and while the platform has gone through a number of changes over the years, the branding has remained pretty much the same. That is, until now. 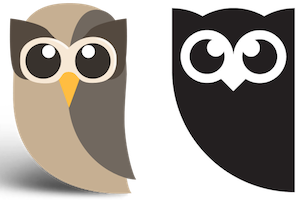 Yesterday Hootsuite unveiled a new look, an update to the dashboard and, almost unthinkably, a new logo. Which means a new owl. Yep, Owly, their mascot, has a new design which is very clean and entirely black, reflecting the “simple, reliable, and confident aspects of our brand”, says Hootsuite. Also, note that “Hootsuite” now uses a lower-case “s” (previously the company was HootSuite). Indeed. The platform has been operational since 2008 and that’s a long, long time in the heady world of social media. HootSuite now employs 500 people with offices in Vancouver, London, and Singapore, and the dashboard supports 15 languages. The timing feels right. Few people embrace change, but the update to the dashboard is fairly modest – HootSuite has switched the placement of the message box and profile selection widget, and the site’s favicon has updated to the new design.